Once people have found out I’ve been using Twitter for all of about 4 months now they think I’m an expert (I’m not, and do not profess to be) and keep asking me; what is it all about, then? Good question, and not one I’ve really been able to answer for myself, let alone answers for someone who hasn’t spent time trying different things to see if it works for them or not. Work out what you want to get out of Twitter. If you don’t do this, then Twitter will be a waste of time. if you are an eLearning specialist, or you are developing new mobile learning (mLearning) technology, or you just want to talk to people who like to run marathons, then these are the kind of people you should be looking for. Use the Twitter Search to find instances of that word, and use the Profile Search to find people with interests that match or complement the reason why you are on Twitter. Without a purpose you will find Twitter confusing and worthless. Make sure you put some relevant and interesting information in your Twitter profile. I often ignore and block people who put things like “mum, sister, daughter, and friend to everyone” as it means nothing to me and why I might want to follow you. I am using Twitter to find like-minded professionals (and amateur eLearners) so look for people who use the profile to advertise their eLearning prowess. You can put a picture of yourself in your profile, use it wisely! I don’t like seeing pictures of people drunk, so it isn’t a good look on your profile. Also, using a picture that looks like you’ve taken it from your passport may not be the best way to ‘advertise’ yourself (unless it’s the best picture you’ve got). Share and share alike. When you find something that you like, and want to share it with your own network of followers, don’t be selfish and pass it off as your own work, use the ‘RT’ (re-tweet) and acknowledge the originator. This ‘kindness’ will also mean that people will click through to you if someone retweets one of your post … thus you will gain more followers as a result. Use URL shortening service. There are a few services online that will give you a new URL that is shorted than your original, much better for using when you’re limited to 140 characters (see above image for example). Good services to use are TinyURL and Bit.ly. Look at people who follow someone in your network. Look at the people who follow someone who you already follow, there could be a few good contacts for there too. Don’t be afraid to ‘block’ people who you don’t think you want following you. These can be anything from businesses trying to sell something, automated accounts that don’t have any visible purpose, someone who has nothing in common with you. You can identify these kinds of accounts by looking at their follower/updates list; if they are following 10,000 people, have 20 followers, and only 1 update then I’d safely say it’s an automated account and can be ignored! Don’t worry about numbers. Don’t worry about the fact you have only 5 or 6 followers, this will grow the more you use Twitter, the more people you follow, and the more you use/post to Twitter. Remember that everyone started off with no followers at the beginning. If you know colleagues or friends on Twitter then find them and start testing things with them. 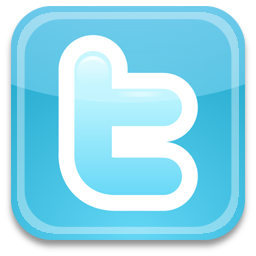 Use a desktop service to manage your Twitter account. 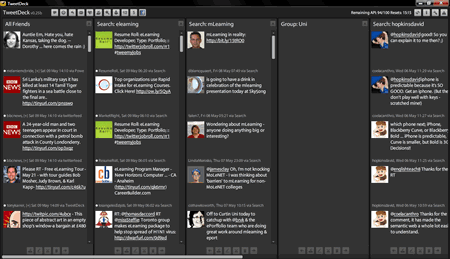 I use Tweetdeck as I can have some ‘searches’ saved that pull back results from Twitter (not just those people I follow) on any search term (eLearning, mLearning, Blackboard, etc) as well as quickly and easily see retweets , mentions, and messages. I can also group my followers into different colums so I can follow different people from different specialities. Use #Hashtags. Hashtags are great for pulling people together on a specific topic. They are being used to pull conferences and/or training together. Finding a hashtag for a chosen specialisation will also find you more people to follow (and can follow you, if you use it). Do more than just tweet about yourself. If all you do is tweet about yourself and what you’ve just done (work, home, hobby, etc) then you will probably find your list of followers drop. By engaging your followers on their content, by retweeting (see above) and adding links to web articles you find you will be “adding value” to your network and the people in it. Be polite. No one likes a smart-arse, and no one likes to be flamed. You will make contacts and a network from all around the world, but it takes time and this relationship is likely to be tentative for longer than a traditional networking opportunity that was made face-to-face. Enhance the classroom experience. Yes, that even means letting your students online with laptops and other devices when they’re in your classroom. Use a hashtag and ask your students to use it on each tweet; this means you can easily collate tweets together at the end of the alloted task/activity/time. Bring student ideas, reading, emotions, etc into your world. Whether Twitter is used in the classroom or just around each timetabled seminar/lecture time, Twitter and it’s use can add value to the contents or your teaching, and you’ll end up learning from your learners. Widen your network. By finding and following people in different parts of the world I am getting different ideas and techniques for eLearning that I would not have necessarily worked out on my own. Twitter can improve your working knowledge if you let it. Remember, Twitter has been described as “the largest staffroom you’ll ever find”. Use it wisely! ← Previous Previous post: Next phone; what to get?